Eric Butts is what you might call a “reaction YouTuber”. He makes videos where he watches trailers and reacts, whether that’s with laughter, bemusement or even tears. 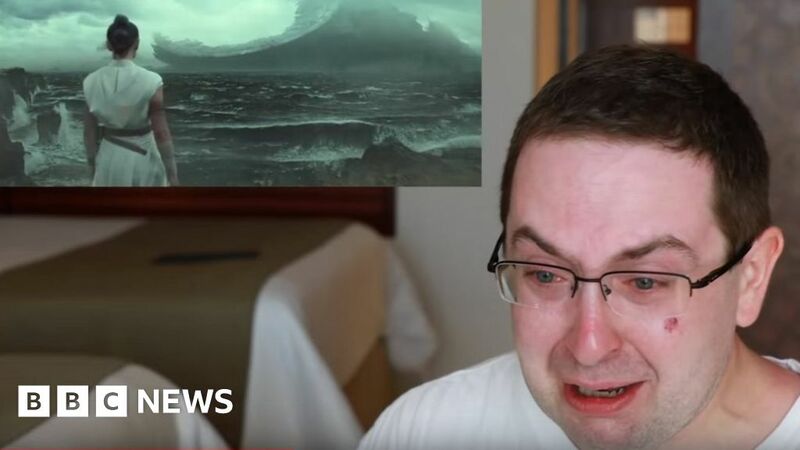 So as far as he was concerned, a recent video where he cried while watching the new Star Wars Episode IX teaser trailer was not unusual. As social media became saturated with hate-filled tweets and his video was viewed more than 6.8 million times on Twitter – at the time of writing – it seemed there would be no end to people mocking him for his reaction. That is until his video caught the eye of Mark Hamill, the actor who played Luke Skywalker, who tweeted his support. Eric told the BBC that “with a name like Eric Butts” he was used to getting insulted online. “It wasn’t really getting to me,” he said. “When it all started, before Mark Hamill got involved, I was on holiday for my 40th birthday with my fiancee. On return from his holiday, Eric was still receiving negative comments, but was happy that he was getting money from the ad revenue on YouTube. “So I was thinking, hey, I’m making a few extra bucks and I can buy a video game,” he told the BBC. A prominent Twitter commenter suggesting it made them want to “cringe to death”. Another called Eric part of “a whole new population of undateable men”. This was when things took another turn for the worse. “There was some really horrible stuff,” Eric said. “They took my reaction video and changed it so they had me react to other things. Eric said this was the lowest point, but also what sparked the highest point – a second reaction from Hamill. “The next day things legitimately got to me,” he said, “but in the best of ways. Eric explained that the Star Wars actor’s involvement started a shockwave of positive feedback. The support came from all angles online, whether it be Star Wars fans, fellow YouTubers or self-proclaimed “proud geekazoids“. And game designer Cory Barlog tweeted his support, even changing his Twitter name to #undateable in reference to a critical tweet. As a creator, it is videos like this that give me the strength to continue in some of my darkest times. This man represents a true connection between creator an audience and i am so thankful to be able to witness this. He is a hero and i would date the hell out of him. Suddenly Eric was receiving support from film-makers themselves, with Zootopia and Moana writer Jared Bush saying that his enthusiasm for films “means the world”. It culminated in Star Wars Rogue One writer Gary Whitta revealing that he was a closet fan of the YouTuber – even slyly starting the tongue-in-cheek hashtag #ILoveButts. But it was the tweet from Hamill that meant the most to Eric. “When Mark Hamill tweeted me,” he said, “my hands started shaking. “Star Wars has been such a huge deal in my life from my childhood onwards. And Eric had a smart response to the “undateable” tag too – posting a photo to his social media followers of his fiancée’s hand littered with five different engagement rings.